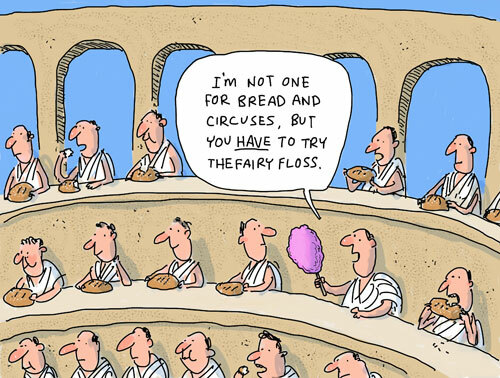 You are invited to the Opening ofÂ Bread and Circuses, an exhibition of Sightgeist cartoons published inÂ The Weekend Australian Review, and the official launch of the 2012 Kudelka calendar.Â There will be wine and cheese, but unfortunately we couldn’t get hold of a fairy floss machine. I would appreciate a comment at the end of this post or email if you’re planning on coming in case we need to buy more grog (there’s also a fancy facebook page). Posted in News and tagged kudelka, bread and circuses, exhibition. I can’t make it tonight, but I should be able to check it out this weekend. Congrats! Dang – I missed this! Don’t suppose it’s having an extended showing? ?